While Junior is trapped for 8 days beneath his collapsed house after an earthquake, he uses his imagination for comfort. 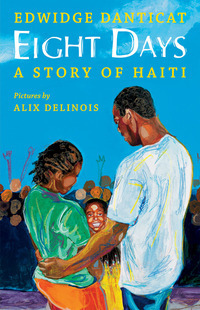 Drawing on beautiful, everyday-life memories, Junior paints a sparkling picture of Haiti for each of those days - flying kites with his best friend or racing his sister around St. Marc's Square - helping him through the tragedy until he is finally rescued. Love and hope dance across each page - granting us a way to talk about resilience as a family, a classroom, or a friend. This is a beautiful book. My children and I found it sad but also hopeful and positive. I was very touched by the boy’s imagination and courage in the face of his dire situation. It made me appreciate how children face daunting events, especially devastating ones. My children asked a lot of questions regarding earthquakes and the situation in Haiti. The illustrations are bright and colourful symbolizing, for me, the Haitian people, whom I know to be a generous and resilient people. I have friends who have lost family in the wake of Haiti’s earthquake, and I have been told of the extraordinary kind gestures of many as they came to the aid of people I consider my spiritual brothers and sisters. The author’s message is upbuilding. The love of her country and the children of Haiti resonate throughout the pages. Truly a touching and heartwarming book. Disclosure: Thanks to Nikole Kritikos from Scholastic Canada for sending me this book for review. I was not compensated in any other way, nor told how to rate or review this product. This sounds like the kind of book kids should be reading. Great review.